A human pilot flew a real jetpack for 20 glorious seconds in front of a packed crowd on Saturday at the "Future is Here" festival, hosted by Smithsonian Magazine. The pilot flew around inside the cavernous atrium of the Ronald Reagan Building and International Trade Center. The jetpack can fly for a maximum of 26 seconds before it runs out of juice, according to Jet PI, which built the futuristic flying device. 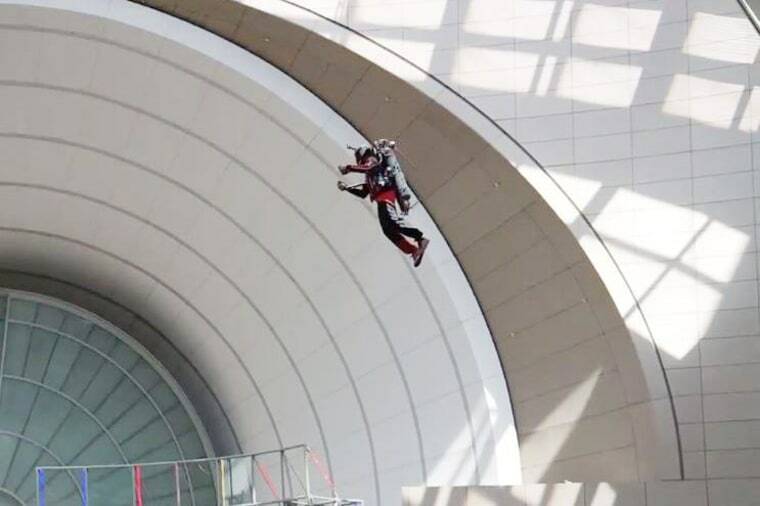 The demonstration was the jetpack's first indoor flight in the United States, apart from the company's warehouse. The jetpack is fueled by hydrogen peroxide and nitrogen gas, which react in the presence of a silver catalyst to produce jets of compressed steam that provide the necessary thrust, company officials said. The pilot uses a handle on one hand to control the pack’s flight dynamics — including roll, pitch and yaw — and uses the other handle to control the power. The contraption itself costs between $100,000 to $150,000, but you can’t buy one of these bad boys in stores yet (at the moment, you can only buy the parts and assemble them). The past, present and future of jetpacks will be featured in an upcoming Smithsonian channel documentary. This story originally appeared in Live Science. Read the entire article here. Follow Tanya Lewis on Twitter and Google+. Follow us @livescience, Facebook & Google+.